I can’t imagine a crazier month in the film industry agenda than the March I just wrapped in Austin. At the opening end: the SXSW Film festival (March 7-15), one of the top film festivals worldwide and spawning ground for a great, growing, democratizing wash of digital content that’s seemingly indifferent to what screens it eventually lands on. At the other end, also in Austin: the Giant Screen Cinema Association’s Film Expo (March 24-25)– that stalwart bastion of IMAX and all films that you can only see big– the bigger the better and if it’s still big lush 70mm celluloid whirring through the projection booth the better (for now– spoiler alert– IMAX is going all digital too). There has probably been no single month in which to better examine the future of film technology. And by extrapolation, ask: what’s the future of large-venue video projection for all the other markets downstream? Will film as a separate art form– grounded in the movie theater experience with its requisite high resolution and high production value DNA– even survive? Will cinema, and the high end video technology it spins off for other industries– AV, consumer electronics, TV– keep on a trajectory to increasingly better image fidelity or will it go the way of music toward dumbed-down platforms that sacrifice resolution and fidelity for easy distribution? SXSW Film has risen fairly rapidly to be one of the top five of most critics’ and film analysts’ list of the top film festivals. Whether this is a tribute to the event’s inherent strengths under the excellent direction of Janet Pierson or the mash up boost it gets from being rolled in together with SXSW Music and SXSW Interactive is an interesting question. Since the breakthrough year 2010 when the interactive program of SX really took off, SXSW has touted the convergence of technology and film, to mixed but always interesting effect. It’s unfair, but part of a film festival’s buzz centers on the calendar: the earlier in the year the better for the growth and success of the event. Sundance ranks #1 and the fact that it’s in January helps. So while Toronto is more of a mainstream and international festival and is late in the year (September), SXSW Film had the good luck of being launched, joined at the hip with SXSW Music, in March. So it’s early in the film year, can ride the coat tails of Sundance, and can also ride the coat tails of a big music-interactive-movies mash up that only SXSW has managed to pull off. And SXSW Film, more than the other festivals, puts a lot of stock in its conference program, so the buzz is not always about the movies themselves. There are always a lot of heavy hitters on the panels. 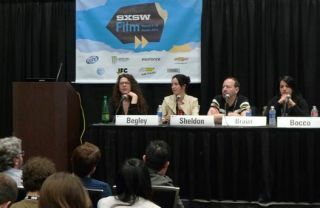 What were the business and technology trends that stand out from SXSW Film this year? No one at SXSW would phrase it this way, but there’s no other way to put it: Television is maybe not eating the film industry, but it’s very hungry and an entire generation– the newest generation– of filmmakers are low hanging fruit. A quick glance at the new movie distribution landscape, via SXSW, tells the story. In a lively panel session at SXSW Film in March called “After Wrap: Finding The Right Distribution Partner”, moderator Elizabeth Sheldon, SVP at Kino Lorber, explored how “to get the attention of the Right Distributor for Your Film”, with panelists Josh Braun (Submarine), Dana O'Keefe (Cinetic Rights Management), Arianna Bocco (SVP Acquisitions, IFC) and Dori Begley (SVP, Magnolia Pictures). The panel did a good job of laying out the new landscape of movie distribution. A walk through that landscape shows that most movie roads lead to television in some form. But certainly theatrical release is still the end goal? “The dream of theatrical release”, said Braun, “is not automatic for producers any more”. I’d put the emphasis on the word “dream”. Not only is theatrical distribution not in the cards unless you’re one of the top Hollywood studios, few producers even dream it now. Digital rights are the bread and butter of movies now. What does that look like? DVD and/or BluRay? Sadly, no, they are on the wane as streaming now reigns: VOD (video on demand)– but you need to distinguish between traditional VOD like Netflix and HBO that are subscription models, and Transactional VOD where a consumer pays to view a specific movie. But we’re not completely out of theatrical release, with VOD. The distribution goal now involves some kind of Day and Date– a general term for the collapsed window that now characterizes multi-platform strategies. The old Hollywood model– where a movie was released first for movie theaters, followed by airline and paid hotel showings, then DVD (then later BluRay), then pay-per-view cable, then premium cable (HBO, etc. ), then broadcast and basic cable, is dead. That multi-tiered strategy offered some exclusivity to each exhibition and distribution company in its particular stage of release, so that each tier had its own “window” to present the film. Now, the release “window” is not closed. We have to mix metaphors: the window is collapsed, and often upside down. Day and Date originally meant simultaneous theatrical release and VOD release– multiple windowing to theaters and to VOD like Netflix and iTunes. Let it rip and hope for the best. This model really gained traction after the financial stresses of the 2008 crash proved disastrous for theatrical distribution for many mid and small film distributors. Many just went out of business. A few like IFC and Magnolia survived because they pioneered Day and Date, where P&A (“prints & advertising") funds could be leveraged for multiple platforms simultaneously– but with most hope for revenue being put into VOD. Then Magnolia first started using the term “Ultra” for a twist on Day and Date: pre-theatrical VOD. In this model the first exclusive goes to VOD, but after a month or so the movie goes to theaters, the idea being not just maximizing P&A but using the VOD window to build audience interest for the theatrical release. In that same Hawking vein, at SXSW Film 2014 directors Angus Macqueen and Guillermo Galdos debuted their movie The Legend of Shorty– a documentary whose plot revolves around the filmmakers literally trying to locate their subject, "EL CHAPO” (Shorty), the leader of “the biggest drug cartel in history”– while also trying to 180 normal distribution schemes. The movie, produced by Red Box Films, Twofour and Ronachan Films, with funding from Film4, WGBH Frontline, Discovery Latin America and BFI, was ostensibly already a lock for TV broadcast. But like Hawking, the idea at SXSW 2014 was that viewer/reviewer buzz for The Legend of Shorty might drum up theatrical distribution in the meantime. Surprisingly, the DEA had just succeeded, weeks before SXSW 2014 opened, in doing what the filmmakers could not accomplish– actually finding El Chapo. Will the filmmakers have more luck finding theatrical distributors than they had finding their film’s subject? Frontline has the TV rights to the movie, so can it really work in the marketplace, to make money for a distributor or cinema? The real question is, what do all of these distribution gymnastics say about where movies are headed? They say that as it has threatened to do so many times over the decades, TV, an old medium not a new one, is the disruptive force. Or better said, TV is not so much disrupting, but could be poised to eat all in its path. This only sounds ominous if you love the big silver screen, the idea of the cinematic experience, the excitement of ever-improving production and exhibition technology. If you think that that experience is part of the art form. If you just love content– anywhere, any format, any time of day or night, “just get the content to the people” then you probably think this is the golden era of the movies. It could be– and I’m amazed that at a Film festival like SXSW you can see the struggle for attention of such a vast cross-section of creativity– this year, from brilliant, important international art films like Alejandro Jodorowsky’s first film in 23 years, The Dance of Reality, to mainstream debuts like Chef, Joe and The Grand Budapest Hotel, to compelling and technically innovative documentaries like DamNation and The Case Against 8. Alejandro Jodorowsky’s first film in 23 years, the amazing Dance of Reality, screened at SXSW Film in Austin. Jodorowsky is shown here on the set, in the boat (middle). Yet, at a vibrant and growing SXSW Film that stands near the top of the movie industry pyramid in terms of trend setting, it is sobering that such a big trend is TV. Of course, you don’t call it TV, it has now been given an important-sounding imprimatur. SXSW 2014 was the inaugural year for their “Episodic” program. Fancy name for slipping actual TV shows like Cosmos and From Dusk Til Dawn into a Film festival. And really, it’s a bit redundant creating such a category since most of the films that were shown at SXSW– or any film festival– are indeed headed one place (if the film is extremely lucky): to TV (where BTW, metrics are sketchy at best: Netflix and HBO don’t have to report the couch potato equivalent of box office to anyone let alone filmmakers... Ah but that’s another story). And TV’s technology platform– the distribution behind it all, can not help but dictate the nature of the form, the art form going forward. When you talk TV, the distribution dictates the technology. Oddly, just weeks after SXSW Film 2014 wrapped, Austin hosted another film industry event. One that could not have been more different than SXSW. The Giant Screen Cinema Association’s (GSCA) Film Expo 2014, that took place March 24-25 at the IMAX Theater in the Bullock State History Museum in Austin, TX. No mystery here, as to whether a movie is made for a huge silver screen, or YouTube. This is about all big screen all the time. What does that mean? It means the IMAX and Museum markets. IMAX film is the holy grail of cinema if you love the highest resolution, most lush, most detailed images in all their big-screen glory. It’s not all film (celluloid) today, but it’s the last bastion of celluloid. And if you love “1570” (15-perf/70mm film-based format), enjoy it while you can. Last October IMAX announced that it is accelerating the transition to digital in its theaters. There are now only about 170 film-based theaters in the IMAX network worldwide. About 20 of those are commercial movie theaters that concentrate on showing mainstream Hollywood movies. That leaves about 150 IMAX theaters that are associated with institutions, mainly museums. IMAX typically spends between $30,000 to $50,000 per movie per theater when it distributes film prints, a math that is self-dooming in today’s world. Also last October IMAX reported total global box-office of $132.5 million in the third quarter, down 23 percent from the same period in 2012. But the movie Gravity, which was not provided to IMAX theaters on 1570, but only on DCP, generated almost $1 million at Lincoln Square in New York City and another $1 million between the TCL Chinese Theatre in Hollywood and the Metreon in San Francisco– all theaters that had just been converted from 1570 to digital. Interestingly, IMAX generated more than 22% of Gravity's domestic box-office gross despite accounting for fewer than 4% of the screens showing the film. "In the past, we had to subsidize film prints for titles that were not necessarily expected to be big blockbusters in order to have product for these large, film-based theaters," IMAX CEO Richard Gelfond told financial analysts in a conference call last October. "Now, we can be more selective." All that being said– I sat down last week in the big beautiful IMAX theater ready to be amazed again, and ready to see what the transition from 1570 to digital is looking like, up close. From a technology perspective, day one of the event offered up the usual fare of films being marketed to the school and museum market. And while I did not see many screening the ones I attended did not wow, either technically or with content. Most of the attendees were not technology geeks. OK, that is refreshing, but one film producer’s intro to a screening of their company’s latest offering set the tone for me. The film was about great apes, and the producer thanked the audience for coming, and assured them that don’t worry, the movie did not contain the “E-word”. You don’t have to work in a K-12 school to figure it out. I was in a world eons away from the SXSW event that had taken place down the street just a few weeks earlier. What a difference a day makes. Day 2 of the GSCA Film Expo 2014 brought some surprises and delights. It started with a presentation from some of the top execs and technical crew at Electrosonic, the company behind some of the worlds most sophisticated AV, control room, and cinema design/installations. We were off and running. Howe and Conte kicked off the presentation with a beautiful demo of HFR (high frame rate). The demo used the same rig that was used throughout the 2-day event to show all the movies: two synced Christie DLP 4K projectors, 35K lumens each, contrast of 2,100:1 full field– and both with live inputs as well as IMB (a Spyder was used as a content input controller). And while I had seen such HFR demos at trade shows like NAB, it was nice to see it “in the field” at something other than a Hollywood tentpole movie. The 48fps vs 24fps A/B demos– also showing narrow to wider shutter angle configurations– showed how motion artifacts were eliminated with the HFR. Howe and Conte stressed that today “Giant Screen” really means 4K. And to bring the point home, Conte introduced a beautiful aerial photography sequence shot in 4K digital by the same production crew in New Zealand that show much of the Lord of the Rings and Hobbit movies. Conte explained that they shoot for a target brightness on the screen of 14fL for 2D, and 6 fL for 3D, and his demos showed that when done right, on both sides of the camera, and in exhibition, digital can rival 1570. • More2Screen, that brought the British Museum’s “Live from Pompeii” movie; and a Peter Gabriel concert. Electrosonic's Chris Conte demonstrates at the GSCA event in Austin how live concerts can be brought live, in 4K, to giant screen venues, adding alternative content to the programming mix. If you have not seen a production like one of the above, in 4K, high lumen, huge screen, and with Dolby audio, you need to see what happens when you combine the best of large screen, IMAG, 4K, HFR, and full surround audio. The GSCA Film Expo 2014 ended not with demos or presentations, but with a shootout of sorts, between the best of 1570 and the best of digital. But this ending was not to be demos, it was movie vs movie. In one corner: Jerusalem (www.JerusalemtheMovie.com), the IMAX 1570 (in 3D) documentary about the city told by following the story of three young women who live there (one Muslim, one Christian, and one Jewish). Director, Writer, Producer: Daniel Ferguson. Narrator: Benedict Cumberbatch. Filmed with four different cameras: IMAX 15-perf 65mm film; Sony F65; RED Epic; and Nikon D800E. Wonderful visual narration using the city as a character, epic in scope, and both historically sweeping and intimate. A powerful movie for the big screen, for this genre (we’re still in the broad “educational” category for museums, with some spillover to broader commercial IMAX). In the other corner: Deep Sea Challenge, the National Geographic produced documentary about James Cameron and team’s record-breaking 35,787-foot (10,908-meter) solo dive to the deepest known place on Earth. Producer and director: Andrew Wight. Also in 3D. Director of Photography, Jules O'Loughlin, ACS. Cameras: Red Epic Cameron/Pace 3D Rig; 2 Sony P1 Cameron/Pace 3D rigs; a Red Epic Cameron/Pace 3D underwater Rig; a Sony TD300 side by side rig and 3D Go Pros. And of course, lots of James Cameron on screen. The result: Lush, bright images even in 3D! Why the exclamation mark? Because the lack of brightness for 3D digital projection today is the Achilles heal of 3D. So this 3D movie, is a milestone. The 3D is toned down, BTW, as Cameron has learned to do better than any director working today. And Cameron is one of the few directors/producers that knows how to both shoot and post to compensate for the fact that that a lot of lumens get lost by the time you get 3D to the screen. James Cameron wraps Deep Sea Challenge, on location above the Mariana Trench off the coast of Guam. After a couple of days of watching some truly stunning 1570 IMAX, and some digital trying to substitute in, score one for our team. What team? It does not matter if you swear by 1570 as gold standard for the best image, technically, that you can put on a screen. Even IMAX is abandoning film (a 70mm 3D film print of the movie Jerusalem weighs more than 500 pounds… you do the shipping math). The future is getting all-digital pixels, more pixels (4K, and 8K), and faster pixels (HFR), and more lumens (laser light source projectors are coming) on to the screen. We are getting there, fast. So a Mad March is wrapped, but no rest for the movie-weary as I’m heading now to the NAB show in Las Vegas– the Cinema Summit kicks off April 5th on the eve of the NAB show itself– to see what Hollywood has to say about all this movie madness.